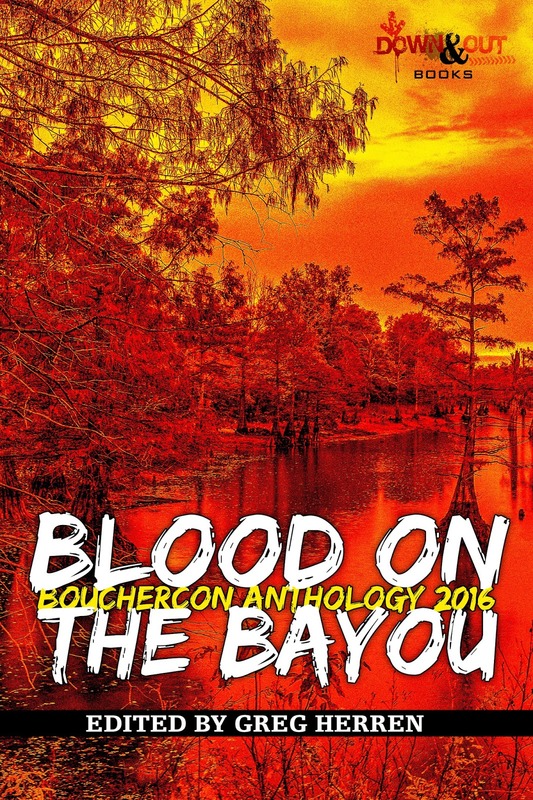 We're kicking off Bouchercon New Orleans week with an interview with Greg Herren, editor of this year's Bouchercon anthology, Blood on the Bayou. What could be more fun than New Orleans and Short Mystery Fiction? Greg has edited 17 anthologies and has more than twenty books published. He writes two series: The Chanse MacLeod mysteries and the Scotty Bradley adventures. Both series feature gay men private eyes and are set in New Orleans, which is where he lives now. He also writes books for teens. The Blood on the Bayou anthology makes it's debut this Friday in print and as ebook. All proceeds from the anthology go to the New Orleans Public Library. It features stories by David Morrell, Elaine Viets, Terrie Farley Moran, John Floyd, Deborah Lacy, Edith Maxwell, Alison Gaylin, Gary Phillips, O'Neil De Noux, Sheila Connolly, Eric Beetner, Thomas Pluck, Kaye Wilkinson Barley, G. J. Brown, Barbara Ferrer, BV Lawson, R. T. Lawton, Liz Milliron, Dino Parenti, Michael Penn, and Paula Pumphrey. Heather Graham provided an introduction for the book and it's published by Down and Out Books. My story, Blowhards on the Bayou, takes place on a Mardi Gras float and it was a blast to write. You can learn more about the story this Friday on Drinks with Reads where we'll match the story with the perfect drink. You’re the editor of this year’s Bouchercon anthology, Blood on the Bayou, that benefits the New Orleans Public Library. How did you go about selecting the stories? How did you know what order to place them in? Can you tell us about a few of the stories in the anthology? Well, I didn’t actually choose the stories myself. I did the initial cull from everything submitted; and then turned the stories over to volunteer readers, who read them blind—not knowing anything about the author. The three readers voted on a point system, and from that, the final stories were chosen. I was very pleased with the results, honestly; but all the stories that went to the final readers were worthy of being included, really. I was pleasantly surprised how many good stories were submitted—it would have been easy to do two volumes. I think this is the 17th anthology I’ve edited; and the first one I’d done from an open call in a long time. I actually stopped doing open calls because I was getting a lot of stories that weren’t quite ready. The order for the stories…I wish I had a better explanation other than it is kind of organic and intuitive for me. I believe every story should lead to the next, if that makes sense. When I am reading the stories, it just comes to me—‘oh, this is the one I want to go first, this one should go before this one, that one should come after this one’—that sort of thing. I just trust my instincts. I do worry about the order, that I have done it properly, but once it’s done, it’s done. Alison Gaylin’s story, “Icon,” is a really chilling story about the daughter of a celebrity couple who live in New Orleans and her nanny being followed by a tabloid photographer. Thomas Pluck’s story, “Gumbo Weather,” features a character he is going to continue to write about, which is terrific. And Elaine Viets’ “Good and Dead” is a story featuring her Dead-End Jobs series character, Helen Hawthorne. I could go on all day—your story, “Blowhards on the Bayou,” is sly and clever and funny; I’ve read a lot of New Orleans stories but never one set on an actual Mardi Gras float! I may steal that for one of my books…but really, all of the stories are exceptional. I could talk about them all day. Can you tell us about your story in the anthology? My story, “Survivor’s Guilt,” is a story I never thought I would write—one I actually swore to myself I’d never write. It’s a Katrina story, set in the city during the flood. I evacuated, and watched it all happen on the news. Since I wasn’t here, I swore that I would never write one of those stories…I know a lot of them, unfortunately. I’ve heard trapped on roof stories, Superdome stories, didn’t evacuate but didn’t flood stories…I wrote them all down, there was a time when I thought about doing an oral history so the stories wouldn’t be lost but finally decided against it. But this story…when I was thinking about writing a story for this book, this was the first thing that came to mind and I tried other stories, but kept coming back to “Survivor’s Guilt,” and finally just gave in. Just goes to show—you should never say you’ll never do something. This year’s Bouchercon is in New Orleans. Why are you excited about this year’s convention? What should Bouchercon attendees not miss in NOLA? I’ve lived in New Orleans for twenty years, and was a regular visitor before I moved here. I love New Orleans, and I love when people come to New Orleans and get to enjoy it. I’m staying at the host hotel—it was just easier than trying to commute back and forth from home, so it’s kind of a ‘vacation’ for me as well. I always enjoy Bouchercon because it’s fun to see all of my writer friends all gathered in one place…and this year it’s in my town. There’s so much to not miss in New Orleans! There’s so much to see, to eat, to drink…one thing I think people should do if they have the time is take the St. Charles streetcar up to Audubon Park and walk around. Audubon Park is quite beautiful, and that whole neighborhood is gorgeous. City Park is also extraordinary—I think it’s the largest park in the country within city limits? I think it is bigger than Central Park in New York. The Moon Walk at night along the levee in the French Quarter is also wonderful—the moon on the river to one side and the French Quarter on the other. For people who want to shop, Magazine Street in Uptown is great—its lined with shops and restaurants and bars for about six miles. There’s also an outlet mall at the River Walk—at the bottom of Canal Street at the river. And you can’t go wrong with a stroll through the Garden District—Anne Rice’s beautiful former residence on the corner of First and Chestnut is always worth a look. Your Chanse MacLeod books are mysteries set in New Orleans. What inspired you to make this a series? Where did your inspiration come for the first book? For authors new to the series, which book should they start with and why? How did you know that Chase was the character that you wanted to write? I always intended it to be a series, actually. When I first came up with the character, I planned it to be a six book series, with him in a certain place in his life in Book One, and growing through every case until he had successfully dealt with all the issues and demons that had him so closed off from the world and other people in the first book. It wound up being a seven book series….and I have an idea for another, actually. Whether I write another depends on how much the story bugs me to write it. But I pretty much decided seven was the end for him. The idea for the first book was literally this weird sense of how easy it would be to con the gay community in New Orleans. It actually happened a few times. Back in the late 1990’s—as weird as this may sound now—it was really easy for a gay man to get the trust of the community. A business focused on serving the community, some donations to community-based charities, some very public work…and people would trust you. Especially if you were publicly working for gay rights. That concept actually wound up being behind the first two books in the series, although the theme of the second book was ‘how well do you really know someone?’ They kind of went together. The third book was the post-Katrina novel; Chanse returned to the wreckage of New Orleans on the same day I did: October 11, 2005. What Chanse sees in New Orleans is what I saw when I returned. I’d recommend reading them from the beginning, so you can follow his personal journey, but if you only have time to read one, that’s the one I’d recommend: Murder in the Rue Chartres. Not to sound arrogant, but it really captured what it was like to live in New Orleans after the flood, before the city had started to come back. The first five are only available as ebooks, alas, but if you prefer physical books, you can find copies on ebay or other second hand booksellers on-line. There was never any doubt I was going to write about Chanse. When I first thought him up, I knew I was going to write about him. I first created the character in 1990, when I was living in Houston, and I originally envisioned the series as being set in Houston. I visited New Orleans in 1993 for the first time in fourteen years, and that was when I fell in love with the city, and after that trip, there was never any doubt that the series would be set here. I made a couple of false starts with him, but I started writing the book that became Murder in the Rue Dauphine in 1997, sold it in 1999, and it was finally released in 2002. I have no idea why it took so long to go from contract to print…it was a long, torturous wait. What is the best thing that has happened to you as a result of your writing? Just one thing? It enabled me to come back to New Orleans after the flood, because I can write anywhere, and why not come home? If I’d had a different job, I might not have been able to come back. And this is where I belong. Great interview. I am so exited to read this anthology and be at BCON. Not to mention being in New Orleans for my very first time! !